HolidaySmart is the premier online resource for Holiday and Observance Information around the world. Uniting the world through Holidays by sharing fascinating stories, unique ideas, insight, inspiration, dialogue, blogs, and information from credible writers and resources to help bring an understanding across cultures and beliefs. People from every corner of the world love to have a reason to celebrate, to get together, to remember, to honor and to observe important days and events. And every culture and belief has unique holidays and ways in which they celebrate. 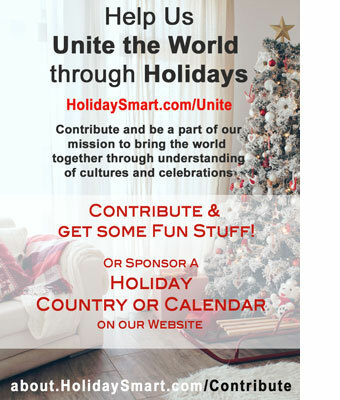 HolidaySmart unites the world by opening up insight into the best in people and their cultures and their beliefs. By sharing in what we celebrate, we can see the good, the fun, and the things that matter to people from other places around the globe. We love to celebrate, we share the most comprehensive database of daily fun, funky and noteworthy holidays. These are the unofficial days that give us a daily reason to celebrate something fun. Our Calendar is growing daily and we are working hard to bring you the best in Holiday and Calendar resources. We love to be engaged with our users and we encourage you to contact us by email or engage with us on our social media platforms.